This course will help meteorologists and others broaden their understanding of the impacts of weather and climate on public health, including the impacts of heat waves and cold temperatures, winter storms and thunderstorms, flooding, drought, poor air quality, tornadoes, hurricanes, wildfire, UV radiation, and others. This course is directed to broadcast meteorologists, in particular, who play a critical role in the community by helping the public to protect against weather-related health threats and by promoting good health. The course also describes the public health communication system, providing information about reliable public health services, tools, and resources. This lesson was pretty directly focused on what I do as a professional, which is in broadcasting. The tips given throughout the module were very helpful in giving me suggestions on how to improve my weather casts and how to better inform my viewers of weather and health-related issues they may encounter. Making the quiz show you what you got wrong so we can learn from it and not just be told you're wrong, figure it out by watching all 2 hours of videos again. The course is very well organized, and it is easy to find exactly what you want to know. The explanations of the topics are simple yet still give a good amount of information. 1. Identify key health-related impacts, factors, implications, and recommendations associated with various weather events, including heat waves and cold temperatures, winter storms and thunderstorms, flooding, drought, poor air quality, tornadoes, hurricanes, wildfire, UV radiation 2. Describe how broadcast meteorologists, working in partnership with public health agencies, can help protect and enhance the health and well-being of the viewing public. 3. Identify key public health support services, tools, and resources that are available to broadcast meteorologists at local, state, and national levels. 4. Identify the basic components of effective risk communication. 5. 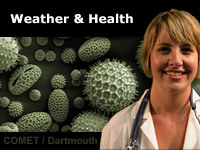 List or identify some examples of weather-related public health risks that may increase with global climate change. 6. Demonstrate an understanding of the causal interdependences that exist between climate, weather, and health.